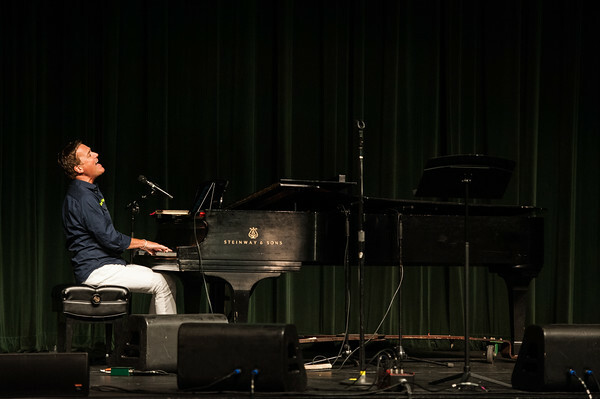 Saltwater taffy, Bob Goff impressions and a large “snake” were all part of Michael W. Smith’s chapel presentation on September 9 on Belmont University’s campus. Smith, a Christian songwriter, has sold more than 15 million albums, scored 28 No. 1 hits, earned three GRAMMYs and more than 40 Dove Awards. “I am free! I am clean! When Jesus sees me, all he sees is white,” said Smith, telling the story of a recent trip to Malibu Lodge in Canada. A group traveled together, taking a lengthy route with ferries and water taxis, something Smith said is different than his normal routine. These opportunities, when one is out of his or her comfort zone, are when Smith said that God speaks the loudest. It was not until Smith was dropped off by himself in the middle of nowhere that he said he heard a loud, yet non-audible voice telling him to baptise himself. Repeating over and over, Smith followed the instructions and lowered himself into the water. When he came up, he saw what appeared to be a long snake floating toward him, all the way to his feet. The ‘snake’ turned out to be a stick, and when he picked it up, Smith said he realized it symbolized a weapon saying, “I have everything I need. If we lean on God, we have everything we need to fight off the enemy.” With the stick on stage with him, Smith said it would forever serve as a reminder of a day God renewed him.